Joins two or more NSF files into a single NSF file. Merges Multiple NSF files into a single NSF. Removal of duplicate items while join and merge. Option to exclude deleted mails from being merged. Provision of joining and merging all the NSF items. Supports Lotus Notes 9.0 and all the below versions. The software facilitates the user to merge multiple Lotus Notes NSF files. All the similar folders of the NSF files will be converted in to a single folder. The inbox folder of all the files will be merged and saved in a single Inbox folder. The Join option will create a single NSF file whilst not merging the similar folders of the merged folders. The merged NSF files can be seen as individual folders in the output NSF file. 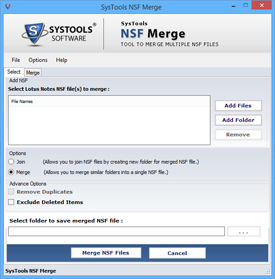 The software gives the provision to remove duplicate items residing within the NSF files during the merge and join process. The duplicate items will be eliminated from the output NSF file. In case the user is looking forward to remove the deleted emails residing in NSF file from being merged or joined into the output NSF file, the software can remove the deleted items as well. The software merges all the items residing in NSF files like emails, calendars, tasks, etc. All the attributes except contacts are automatically merged. For contacts, names.nsf needs to be added separately. NSF Merge is successfully supported by Lotus Notes versions 9.0 and all the below versions. It easily runs on all the Windows OS versions from Windows 8.1 to Windows 2000. In the previous version of Lotus Notes, i.e. Lotus Notes 5.0 and earlier, the size limit of Domino database was limited to 4 GB. However, with the subsequent versions, the story is not the same. The users can store unlimited data in Domino server mailbox. However, the only problem with these versions is that above 4 GB, the database might give some performance issues, which can ultimately result in server crash. Therefore, keeping all these factors in mind, the limit up to which the database can store data is 4 GB. Thus, it follows that for a particular server there might exist several 4 GB mailboxes, in order to save the server from crashing. However, this at times may get problematic for the Domino administrator. Managing a number of mailboxes may result in inefficiency of the administrator and additional efforts. How To Merge Multiple Lotus Notes NSF Files? As seen from the above section, multiple NSF files of 4 GB size limit can get difficult to be managed by the Domino administrator. Therefore, in order make it easy for the admin to manage the data, the NSF file need to be merged together. Merging multiple NSF Files enables the admin to manage the entire database at a single go. It is to be noted, that there exists no manual by which, multiple NSF files can be merged together. Thus for this purpose NSF Merge proves to be the right solution for performing the merging of multiple NSF files. The merge and join options in the software merge the two or more NSF files in different manners. The software also gives the provision to exclude deleted and duplicate items from being merged. It was superb experience to move all Lotus Notes emails & contacts from multiple NSF Files into single NSF File. I recommend NSF Merge Software for easy data management. How can the duplicate items be removed from being merged? The user can select the Exclude Duplicates from the software interface in order to remove the duplicate items from being merged. How can the Notes contacts be merged? The user needs to add names.nsf file separately in order to merge he contacts as well. Will the software merge password protected NSF files? No, the software will not merge password protected NSF files. Does the software support all the Notes versions? Yes, the software supports all Lotus Notes versions, 9.0 and all the below versions. NSF Merge is a very effectual utility. I am really happy with its functioning and glad that I opted for the tool in order to manage multiple NSF files of my organization. Being a Domino admin, it gets really problematic to manage multiple NSF files. The utility NSF Merge enabled me to perform the merge process without any data loss issues. It's really good. The exclude duplicate option in the software enabled me to perform the merge process in a very efficient manner. The resultant files are free from duplicates. I am really satisfied with its functioning. It often happens that online software do not work the same way as they promise. But NSF Merge works in the same way as it promises to perform. I would recommend this tool to others as well.